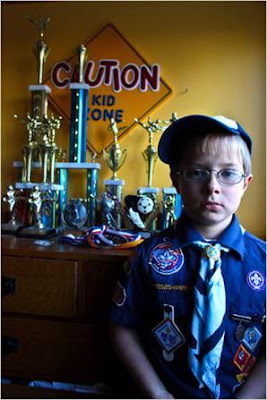 In today's performance of "Security Theatre", it's 8-year old Mikey Hicks of New Jersey: a Cub Scout who is on the Transportation Security Administration's terrorism watch list. Mikey has been on the list since the age of 2, when he was first examined by TSA goons to see if he was carrying any explosives, guns or stabbing weapons. And Mikey doesn't appreciate his constant treatment by Homeland Security one bit: "I don't like being touched in certain spots. They go like, (pat down on the side), and go like that way." Just more proof that our own federal government is a bigger menace than "the terrists" have ever been.